The conclusion of the Raw Feed series on the alternate history anthology series. Raw Feed (1993): What Might Have Been, Volume 4: Alternate Americas, eds. Gregory Benford and Martin H. Greenberg, 1992. “Introduction”, Gregory Benford — Benford’s fair appraisal of Columbus and the effects of European contact with the New World. “Report of the Special Committee on the Quality of Life”, Harry Turtledove — It’s not that I disagree with Turtledove’s satirical attacks using the conceit that King Ferdinand and Queen Isabella assembled a commission to look at Christopher Columbus’ proposed voyage to the New World. I agree with all his criticisms on the timidity of modern Americans, their refusal to run personal risks even with the chance of great gain, their obsession with personal safety and alleged environmental hazards, their technological pessimism, their pouring of money and resources into the rathole of social programs instead of space travel. The opponents of Columbus think his success would lead to inflation without more goods and services, but the story is boring and dull and not really even a story. “Ink From the New Moon”, A.A. Attanasio — I liked a few things about this story: its attempt to imitate an Oriental style, some of its humor (America still has the USA but here it’s the United Sandalwood Autocracies, and I liked Europeans being called Big Noses), and the end where the oriental native returns to Europe with Columbus. And I liked the whole idea of China colonizing America first via Buddhists who flee persecution in the Sung Dynasty. (Eventually, they break away from the Empire.) However, I didn’t really like the poetic/mystic ruminations on life and his relationship with his dead wife all expressed in thick, purple quasi-Oriental prose. He talks of falling, after he is hurled into the sky in an explosion, into emptiness, an emptiness that is a new freedom and that all reality floats in, that “mystery is the preeminent condition of human being”, that this freedom is the knowledge of utter loneliness and rootlessness. Is this existentialism with an Oriental face? I know its annoying and uninvolving as an explanation for the narrator to take off with Columbus. “Vinland the Dream”, Kim Stanley Robinson — This isn’t really an alternate history but a rumination on the study of history, history’s meaning and social value. I liked the central premise: that an unknown hoaxer (and I liked that his identity and character are never truly known) in the early 19th century created the elaborate illusion, through forged documents and fake archaeological sites, that there was a Viking presence in the New World. Robinson’s usual experimentation with style is here. The story is structured on the lines of a scientific paper. But I disagree strongly with the underlying philosophical message (similar to that in John Carr’s What Is History?) that history is ultimately unknowable, that it is less important that certain historical “stories” are true or false than that “certain qualities in the stories … make them true or false”. This is history as myth and propaganda and edifying and cautionary literature. Fictions can have some deep truth or edifying moral or pragmatic warnings. But history, as imperfect as it is, as provisional as the knowledge of the past is, isn’t the place for willful lies whatever the purpose. Just because the noble pursuit of the historian sometimes becomes tainted with willful lies or unknowing errors isn’t a reason to abandon the quest for the ideal. “If There Be Cause”, Sheila Finch — An overly long, usually dull alternate history based on the presumption that Francis Drake landed (as near as I can figure out) around San Francisco Bay and influenced the local tribes. Specifically, they instill in them a hatred for the soon-to-be-encroaching Spanish and teach them the rudiments of firearms and making wine. This story has one of those young woman (it could just as easily been a young man) learning to take her place as a shaman and learning the hard responsibilities of leadership. Here she oversees a war against the Spanish and kills her lover from another tribe who helps the Spanish and callously lets them kill her brother, “hard destiny” as the story calls her role. “Isabella of Castile Answers Her Mail”, James Morrow — I didn’t hate this story unlike all the other Morrow I’ve read. I even liked a few things in this tale of culture shock as Columbus time-travels to modern New York. Columbus is horrified by the grotesque imagery of the “idol” of the Statute of Liberty, her inscription, seeming to point to human sacrifices in the pursuit of libertinism. Columbus is horrified at the sexual mores of his native Cuban New Yorker guide. He is also horrified at his guide’s brand of Catholicism, and the presence of wealthy, respected Jews in New York. However, there is the usual liberal tendencies of Morrow, here manifested by a comparison between New York’s homeless and the persecuted Jews of Columbus’ Spain. “Let Time Shape”, George Zebrowski — Like Zebrowski’s “The Number of the Sand”, this densely philosophical story considers a Panoptican civilization where all the variations of history are studied. Everything — fact, fiction, supposition, the human genome – is fed into a vast computer used to study history, and, here to place the observer in the virtual presence of a significant historical personage. All this in an attempt to find the crucial people of history, the variants which really are significant. Here Zebrowski envisions Christopher Columbus meeting a very superior (seemingly at about a twentieth century level) New World founded by the refugees from Carthage. They’re still bent on destroying Rome and its spiritual heir of the Holy Roman Empire. England has a secret alliance with the Carthaginians. The ambitious Columbus, smarting at the insults and delays caused by the Spanish aristocracy, sides with the Carthaginians in attacking the “Spanish-Italian empire”. It’s an interesting premise, but Zebrowski also manages to link the story to the spiritual plight of an unnamed observer in the Panoptica and his civilization itself. If I am reading the story right, the observer’s civilization is trapped in a psychic and spiritual dead-end, decadent. 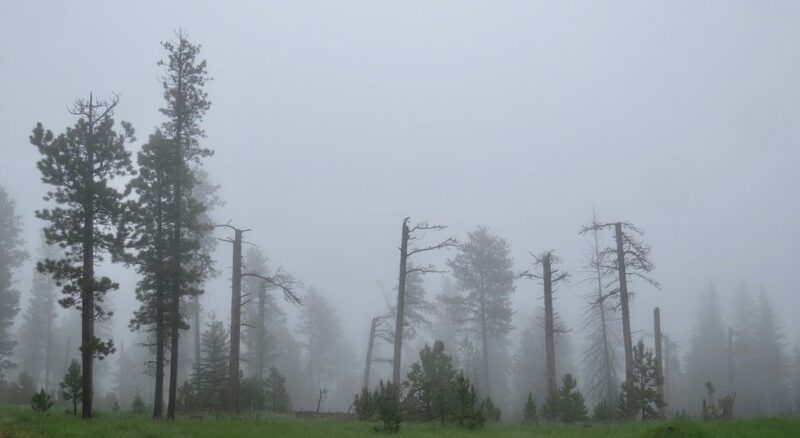 Their recent history consists of watching similar observers in other timelines, of standing aside from history, creeping along at a trivial pace, longing for a quantum transformation but unable or unwilling to find the means in all the observed histories. It’s no wonder the historian thrills to his vicarious possession of Columbus, that he longs to shape history too. But he is not one of history’s rare, finite (in an infinity of variants) significant personalities. A lot of good stuff here: alternate history and far future ennui. “Red Alert”, Jerry Oltion — Essentially a joke story with Red Wing, Sitting Bull, and Geronimo as fighter pilots combatting other pilots like George Armstrong Custer. There’s also the clever pun of the title and non-lethal coup missiles (air to air) used by the Indians. It’s too long too be carried by its jokes, and its too implausible. We’re not only asked to believe a level of American technology accelerated a hundred years ahead of our timeline but that Indians developed a scientific culture that matched that rate. “Such a Deal”, Esther M. Friesner — This is essentially – as befits Friesner – a joke story with a gruesome final punchline. Its humor was sustained throughout but not really enough to make me laugh out loud often. The story itself involves Columbus being financed by Jews and bringing back a contingent of Aztec warriors from the New World to help Spanish Jews overthrow Ferninand and Isabella and stop the Inquisition. “Looking for the Fountain”, Robert Silverberg — As always for Silverberg, this is an engaging, clearly written story. There is humor here of a subtle sort. The Fountain of Youth turns out to be a misnomer. It’s a cure for impotence. The narrator likes to constantly say “Trust me: I was there.” The central idea isn’t humorous, in fact poignant. A group of Frankish crusaders is blown off course, across the Atlantic, and on to the shores of Florida. They intermarry with the natives, convert them to Christianity. The crusading zeal is kept alive by the tribe until Ponce de Leon arrives looking for the Fountain of Manly Strength. They take him to it, though in retrospect the narrator believes they may just have been offering baptism. In return, Ponce de Leon is to bring them ships so they can go free Jerusalem. When he doesn’t return (no one believes he found the Fountain of Youth so he can’t sell the water he takes from the fountain) with the ships, the tribe fiercely turns on other Europeans they regard as false Christians. “The Round-Eyed Barbarians”, L. Sprague de Camp — De Camp takes a very obvious (and surprisingly little used) turning point in history. Unlike our timelines where the Chinese launch seven expeditions using sophisticated ships and compasses in the early fifteenth century under the Ming dynasty and then mysteriously, suddenly stop, they continue with their expeditions in this alternate history. Eventually colonists from this China meet their technological inferiors with European explorers following in the wake of Columbus. However, most of this story concerns itself with culture clash. I suppose that’s an obvious thing to consider given the setup, but I’d have liked more long term exploration of the premise. “Destination Indies”, Brad Linaweaver — This was a disappointment, especially after the author’s excellent novel Moon of Ice. This entire story with Columbus’ rival the Dark Duke, Atlanteans, and the constantly abused narrator who is also Columbus’ Loyal sidekick (he graduated from St. Pedro’s Academy for Loyal Sidekicks) reminded me of the Raiders of the Lost Ark like movie in that novel. It was humorous and captured the flavor of a serial with its suddenly exploding volcano and ending of “To be continued indefinitely”, but it also represents an increasing corruption of the alternate history concept. While this story could be construed (though I don’t see any evidence of this) as an historical drama from a bizarre alternate timeline or a piece of fiction from an alternate universe. But its easier to just see it as an absurdist fantasy that happens to use historical characters in way that is not at all derived from an extrapolation of historical divergence. More and more alternate history writers seem to be writing fables and absurdist fantasies using history as inspiration and characters, but not using the sub-genre for rigorous (or not so rigorous) extrapolation, as a fictional lab for talking about the importance of technology, accidents, personages, and social forces in history. “Ship Full of Jews”, Barry Malzberg — Just when I thought I could get to like Malzberg’s alternate history, he writes this piece of crap that doesn’t work on any level. The story has Christopher Columbus taking a ship full of deported Jews to the New World along with a ship full on converts under the control of Torquemada. In Malzberg style, there are a lot of internal monologues with Columbus that detail his ambition and lust for Isabella. There seems to be some implication that Torquemada intends to literally offer the Jews as sacrifice in the New World as a sanctification. There also seems to be some implication that Columbus is, as one Jew says, “in the control of larger forces”. There seems to be the darker implication that the New World will not become a place of freedom in this world but will be a grim place founded in blood by the fanatical Torquemada, a very different New World. The trouble is that Malzberg’s prose is so muddled that none of this is made clear enough to derive a true thematic statement from or even a clever plot. “The Karamazov Caper”, Gordon Eklund — I liked a lot of things in this story: its grim tone, its grim setting (Alaska is not a site often used in alternate histories), its murder investigation plot, its alternate history involving Russian exploration of Alaska, another subject little discussed in fiction or non-fiction. The turning point is Pope Innocent VIII being murdered in this time line and his successor institutes a “Reign of Ignorance and Dread” that kicks off a genocide of the Jews and the Germans killing Indians of the New World. Columbus, being a Jew, is killed after returning from the New World and further voyages there are banned. Bering is credited with discovering the New World, and its personages. Trotsky is a police investigator for the Czar). However, Eklund throws it all away with his ending. He never really explains why the Indians killed two babies and ate their hearts. Is it revenge for German atrocities in America? If it is, why does Trotsky go along with the cover-up? Out of sympathy for the Indians? “The Sleeping Serpent”, Pamela Sargent. One of the best stories in this book. This book simply postulates a Mongol Empire that got bigger than in our world and endured. The plot involves a Khan’s son coming to the Empire’s holdings in America, forming an alliance with the Iroquois and their confederates. He regards the Indians with special reverence as his genetic relatives – they came via the Asian landbridge – and because they embody what he regards as original Mongol virtues unlike the decadent Empire. The son breaks away from the Empire to form his own Khanate. This story makes me heartily thankful the brutal Mongol’s did not endure. However, the story’s narrator makes clear the Indian’s style of government is more democratic than Mongol tradition, and that the new Indian allies may be tainted by the new warfare the Mongols bring. The story is lean (despite its length), engaging, and thought provoking in the effect the Mongol’s might have had on history. The Raw Feeds continue on this anthology series. Raw Feed (1991): What Might Have Been, Volume 3: Alternate Wars, eds. Gregory Benford and Martin H. Greenberg, 1991. “And Wild for to Hold”, Nancy Kress — This is not a kind story to Anne Boleyn, its focus. Usually Anne Bolyn is portrayed as a sympathetic woman who is interested in not only maintaining her station and virtue but ambitious, willing to rift Henry VIII away from the Catholic Church and, in the future, cause another secular/temporal rift between the Church of the Holy Hostage and the Time Research Institute. Kress does a nice job setting up another historical analog with Mary Lambert’s infatuation with Michael Culhane and Culhane’s infatuation with Boleyn mirroring Henry’s love of Boleyn. She is determined to live her life and have the drama of her averted death and she callously does not care who gets hurt in either of her time streams. Her supporters in England may be appreciated, but she is willing for them to die like her for the sake of drama and stubbornness. As the constable in the Tower of London says, “This lady hath much joy in death.” This story does something not done too often in the time travel and alternate history sub-genres. It gives us the vision of a person contemplating her own alternate history and being made responsible for deeds she did not — but was definitely going to — commit in another time stream. The weird sensation of seeing the actions and consequences of a life you did not live is well portrayed. The Raw Feed series on this classic alternate history anthology series continues. Raw Feed (1991): What Might Have Been, Volume 2: Alternate Heroes, eds. Gregory Benford and Martin H. Greenberg, 1990. “A Sleep and a Forgetting”, Robert Silverberg — Anothery story by the very prolific Silverberg using his historical knowledge. Here Genghis Khan was captured as a young man by Byzantine traders and Christianized. Our staid linguist protagonist Joe decides to have some fun and launches on an historical power trip. Using relay satellites within Mercury’s orbit which send messages back in time, he inspires Khan to become a Christian conqueror against the approaching Moslems. The consequences are left to the reader’s imagination making this a peculiarly underdeveloped alternate history. Still, it was interesting. “The Old Man and C”, Shelia Finch — An alternate history which presupposes Albert Einstein took up the violin instead of physics. (The title is a nice pun on the musical note (and the variable c in E=mc2.) Despite his success, he has the nagging impression (reinforced by the constant references to light in the story and Einstein’s fascination with it) that his life took a wrong turn, that he was destined for bigger things. At his life’s end, as atom bombs enter his world, as his physicist son tells him of the new theory of relativity, his mind wanders and he clearly grasps, intuitively, the new physics. A grim, depressing, poignant story that reminds us of the “dark waters of the soul” where sharks swim to steal our dreams and destiny. As a tie-in to a future posting, I will be doing a Raw Feed series on this classic alternate history anthology series. Raw Feed (1989): What Might Have Been?, Volume 1: Alternate Empires, eds. Gregory Benford and Martin H. Greenberg, 1989. “In the House of Sorrows“, Poul Anderson — The best part of this story is the central image of the besieged library which gives the story its name. The end scene, revealing the pivotal divergent point for this reality — the destruction of Jerusalem (surprisingly revealed to be the story’s setting) and Judaism before its descendent Christianity and its many effects can be realized, was rather poignant. However, Anderson’s attempt to create an alien world and remind us of its strangeness (and that the narrator is not a twentieth century American) via strange diction, syntax, and vocabulary gives the story a difficult, dense, sometimes jerky feel. I think Anderson could have perhaps realized those ends by another tool than rather archaic style. Another Robert Silverberg related retro review. Review: Time Gate Vol. 2: Dangerous Interfaces, ed. Robert Silverberg, 1990. The joints between these six stories are too loose, too many conflicts and plot points aren’t tied off – perhaps because they were left to attach to a third volume that was never done, and too many logical contradictions exist for this to be considered as a novel or even a particularly coherent series of stories set in the same universe. Rather think of each installment as another permutation of the central conceit: resurrecting a couple of historical personages who never met each other and see if anything interesting happens when you throw them together. Almost half the book is taken up by Gregory Benford’s “The Eagle and the Cross“. While it’s a sequel to his much worse “The Rose and the Scalpel” from Time Gate, it’s still an uneasy mix of satire on a future nanny state, Benford’s characteristic interest in the conflict between machine and organic intelligences, and a farce featuring J. Edgar Hoover . Benford doesn’t opt for the probably historically inaccurate version of Hoover as a transvestite and homosexual. Here he comes off as more of a sexual sadist who needs to break in his new assistant – Torquemada. These two strident preservers of the orthodox order are charged with hunting down the fugitive Voltaire and Joan of Arc from the earlier story. Posting this retro review will be one of the few productive things I did today. 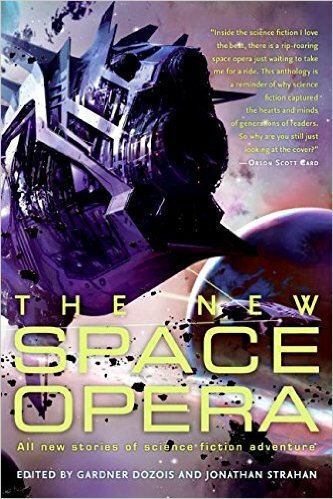 Review: The New Space Opera, eds. Gardner Dozois and Jonathan Strahan, 2007. What is “space opera”? The introduction succinctly and accurately calls it romantic adventure science fiction told on a grand scale. It then traces the history of the sub-genre from its stirrings in the 1890s to its full-fledged birth in the 1920s to its nadir in the 1960s and 1970s, when the New Wave made it unfashionable, to its rebirth, while American authors were developing cyberpunk, at the hands of the British in the 1980s and 1990s. The following stories fall in the unsuccessful and not even space opera category. The setup for Gwyneth Jones “Saving Timaat”, the narrator helping in the negotiations between representatives of two warring groups, the one cannibalistic predators on the other, is good, but the emotional connection of the narrator to the cannibal chief and her motivations are too oblique. James Patrick Kelly’s “Dividing the Sustain” is a would-be comedy of manners about a courier aboard a ship of communist colonists and the steps he takes to get close to the captain’s estranged wife, subject of an unaccountable infatuation, and to avoid getting “stale”, a consequence of longevity treatments. Not at all interesting.